"Advertising is more about manipulation than information." Critically discuss this statement, with detailed reference to the advertising techniques used in one advertising campaign or one class of product. The media are influential in the construction of reality for all of us living in this new world of information technology. It is from our engagements with the media how we perceive what the rest of the world is like. The media are the major means by which we construct an understanding of the lives, values and beliefs of other individuals. Advertising is one of the most ever-present manifestations of popular culture, and yet it has seldom been examined as a form of popular culture in its own right. 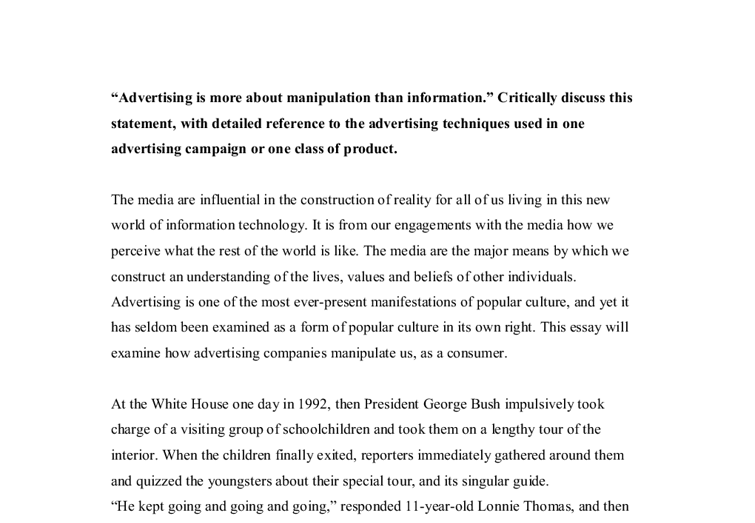 This essay will examine how advertising companies manipulate us, as a consumer. At the White House one day in 1992, then President George Bush impulsively took charge of a visiting group of schoolchildren and took them on a lengthy tour of the interior. ...read more. For millennia the rabbit served as a pagan symbol of fertility, before picking up greater overlays of meaning, as it was associated with the iconography of Christianity. The symbol itself is regenerated each year with the celebration of Easter, when millions of bunny figures go on display. This history of the rabbit is exactly the sort of meaning the advertisers wanted to touch upon. Here was a powerful and ready-made symbol for them to mould and manipulate to use for their advantage. In our modern society, rabbits are a common plaything. Young people grow up snuggling their toy bunnies, children read, or are read stories that amplify the adorability of the rabbit. Most especially is Beatrix Potter's 'Peter Rabbit', who brings to the rabbit symbol, a disregard for rules and a survivor's instinct. If 'Brer Rabbit' is read in a particular family, then the association of the rabbit with wiliness and endurance will be strengthened. All the fondness for all these childhood rabbits, all the meaning already imparted by people to the figure of the bunny, were drawn on by the creators of the Energizer bunny. ...read more. and situates the bunny in a world of leisure and play, where in fact most batteries would be bought. This world of less drudgery and liberation, with pleasant activities and associations, are what Eveready wanted to be identified with. 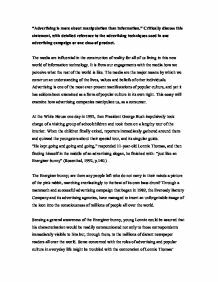 The Energizer Bunny offered an initial indication of the relationship between advertising and popular culture. Typically, advertising draws upon popular culture's stockpile of symbolic material (images or text or music) in an attempt to engineer new symbols with enlivened meanings. People in their culture had already accepted the older symbolic material. All advertisers can do is recondition the public's symbols and pray that consumers will supply agreeable meanings to the new creation. That the Energizer bunny should find popular endorsement marks it as an exception, not the rule. Contrary to apprehensions, advertising does not, and cannot, skilfully mould the symbolic landscape. Its power is limited to playing with symbolic elements, putting together new ones, and hoping against hope that they will work. It is a further comment on advertising's limitations that, although the bunny's prominence allowed Energizer to claim a large share of the battery market, the Duracell Company retained the lead in sales. ...read more. Radio also brigs a wide range of sound effects to involve the listener's imagination in the script. Radio is everywhere. It is found even in the remotest regions of Africa and Asia, and in developed countries it is scarcely possible to escape the blare of portable radios. Therefore, puffery for the reason of Milton Friedman and Craig Smith is ethical. By referring to Appendix 3, vitamins manufacturers used exaggerated statistic research to promote their product. The survey found that only 9% of the participants remembered consuming the recommended number of both fruits and vegetables on the day covered by the survey. Competitive and industry analysis Our competition comes from larger established cable and Internet services. These competitors exist to provide information on a consolidated level by delivering services to groups of cities rather than marketing to a specific locality. What distinguishes our company from others is our focus on Hoboken, it citizens and the businesses that serve them. comment whether they had asked permission of the family to use the photo. There are many advertisements that are far-fetched and manipulate emotive images for their own purposes; Benetton is not alone in this. Sexist, racist and belittling images are used for commercial purposes. risk that the same thing could occur in Uk after the smoking ban takes effect in 2005 - Other leading brands sponsor sports particularly football Guinness Products The BCG (Boston Consulting Group) matrix allows us to position the situation of all Guinness' products.